Catheter ablation has emerged as an important and effective treatment option for many recurrent ventricular arrhythmias. The approach to ablation and the risks and outcomes are largely determined by the nature of the severity and type of underlying heart disease. In patients with structural heart disease, catheter ablation can effectively reduce ventricular tachycardia (VT) episodes and implantable cardioverter defibrillator (ICD) shocks. For VT and symptomatic premature ventricular beats that occur in the absence of structural heart disease, catheter ablation is often effective as the sole therapy. Advances in catheter technology, imaging and mapping techniques have improved success rates for ablation. This review discusses current approaches to mapping and ablation for ventricular arrhythmias. Roy M John receives modest speaking honoraria from St Jude Medical, Inc. Eyal Nof and William G Stevenson have no conflicts of interest to declare. Sustained ventricular tachycardia (VT) and ventricular fibrillation (VF) are typically a manifestation of significant structural heart disease and often associated with a high risk of sudden cardiac death. Implantable cardioverter defibrillators (ICDs) remain the mainstay of therapy for prevention of sudden cardiac death associated with these arrhythmias.1 However, ICDs treat the arrhythmia after it occurs and does not prevent the arrhythmia. Recurrent ventricular arrhythmias can lead to multiple ICD shocks that are painful, decrease quality of life and cause post-traumatic stress disorder. Spontaneous VT and ICD shocks are also associated with an increased risk of death and progressive heart failure.2 Antiarrhythmic drugs, notably amiodarone, reduce arrhythmias for some patients, but have limited efficacy for long-term management, particularly for scar-related re-entrant arrhythmias.3 In addition, antiarrhythmic drugs have the potential for significant adverse effects that includes negative inotropy, pro-arrhythmia and non-cardiac organ toxicities that limit their long-term use.3,4 Catheter ablation offers an alternative therapy for preventing arrhythmias, and can be life-saving when frequent episodes (VT storm) threaten survival. VT or repetitive premature ventricular contractions (PVCs) may also occur in the absence of structural heart disease.5 These arrhythmias are often termed ‘idiopathic’ and generally carry a benign prognosis, but symptoms warrant therapy in some patients. In addition, frequent ventricular arrhythmia can lead to ventricular dysfunction.6 The cause of depressed ventricular function is often unclear at the initial presentation and the diagnosis of arrhythmia induced ventricular dysfunction may become apparent only after effective suppression of PVCs or VT.
For endocardial ablations, access to the left ventricle can be obtained either retrogradely via the aortic valve or via a transseptal approach. The latter is the preferred approach for a patient with severe peripheral artery disease and is mandatory for left ventricular access in patients with mechanical aortic valve prosthesis. In a significant number of patients, especially those with non-ischaemic cardiomyopathies and arrhythmogenic right ventricular cardiomyopathy, ventricular arrhythmia may arise from the sub-epicardium. In such cases, the epicardium can be approached via percutaneous access to the pericardial space. In the absence of prior cardiac surgery or pericarditis, the pericardial space can be accessed via the sub-xiphoid approach by introducing a needle under fluoroscopy and injection of small amounts of contrast to identify the pericardial space.12 Once the pericardial space is entered, a guide wire is advanced followed by a sheath for the mapping and ablation catheter. In the absence of pericardial adhesions, catheters can be moved freely on the epicardial surface for mapping. Prior to any ablation, proximity to the coronary arteries is usually assessed by coronary angiography. Ablation close to a coronary artery poses a risk of acute coronary occlusion and should be avoided.7,13 In our laboratory we tend to maintain a minimum distance of 5 mm from an epicardial coronary artery. Left phrenic nerve injury is another concern and high output pacing is performed prior to ablation along the anatomical course of the nerve to assess proximity of the nerve.14 In some cases a sub-xiphoid pericardial window created surgically can allow epicardial ablation in patients who have had prior cardiac surgery and have pericardial adhesions.15 If epicardal mapping and ablation is anticipated, it is our preference to obtain access to the pericardial space prior to endocardial access and systemic anticoagulation. If, however, the need for epicardial mapping and ablation becomes apparent after endocardial access, anticoagulation is usually reversed prior to pericardial puncture. The 12-lead electrocardiogram (ECG) tracing of the clinical arrhythmia is helpful in determining potential targets for ablation that are also assessed during pace-mapping (see below). While the ECG is often available for patients with idiopathic VT, most patients with structural heart disease will have their arrhythmia terminated by an ICD without an ECG recording being obtained. Although pace-mapping is possible using stored electrogram morphology, it is desirable to attempt VT induction prior to ablation.16 Unless the patient in experiencing a VT storm, our approach is to withhold anti-arrhythmic (with the exception of amiodarone) medications for five half-lives prior to the procedure when possible. If spontaneous arrhythmia is absent, programmed stimulation and burst pacing with or without isoproterenol infusion or intravenous (IV) epinephrine boluses is utilised to provoke the arrhythmia. Whether ablation of VT is best performed under conscious sedation or general anaesthesia (GA) is not known. Both can potentially suppress spontaneous or inducible arrhythmia by reducing sympathetic tone. GA has several advantages. Ablation procedures can be complex and can last for several hours, during which the patients are required to remain still. GA also facilitates stability of the electroanatomical map, which may be dependent on patient position. The frequency and depth of breathing play an important role in determining good catheter contact and stability. Epicardial access is often easier when respiratory motion can be controlled as under GA. In general, we have adopted the use of GA for scar-related VTs and start with conscious sedation for idiopathic PVC/VT. In cases where no VT is documented prior to GA, we have used non-invasive programmed stimulation using the patient’s ICD before induction of GA. Approximately two-thirds of patients with structural heart disease who are referred to us for ablation have haemodynamically unstable VT precluding mapping and pacing during induced VT. In addition, patients with severe left ventricular (LV) dysfunction can experience haemodynamic deterioration during prolonged procedures under GA. To secure haemodynamic stability during VT ablation, the availability of haemodynamic support is important. Inotropic infusions are most commonly used. Intra-aortic balloon pump is the most commonly used assist device in our facility but has limited efficacy for maintaining haemodynamic stability during VT. Percutaneous LV assist devices have the advantage of maintaining end-organ perfusion during unstable VTs. Preliminary studies show safe use of these devices during VT ablations.17 Randomised trials to evaluate outcomes are currently ongoing. Patients with VT and structural heart disease usually warrant an ICD as protection from sudden death. As noted above, prevention of recurrent episodes of VT is desirable. 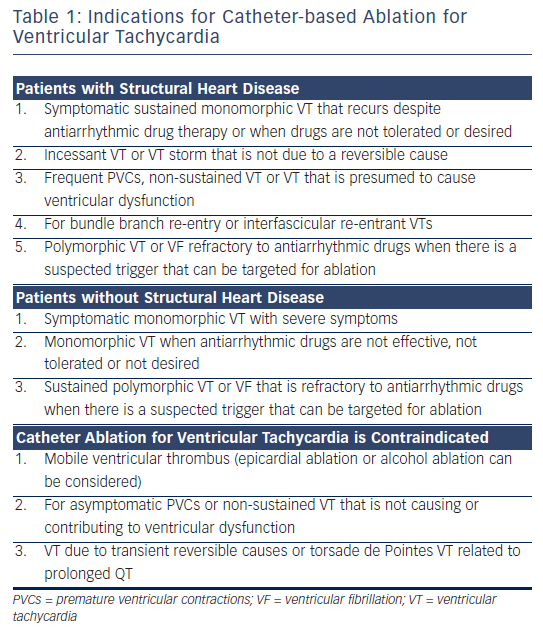 Catheter ablation is most commonly recommended for patients with monomorphic VT (see Table 1). For polymorphic VT, ablation is largely reserved for patients who have an identifiable triggering focus, often recognised from spontaneous PVCs that can be targeted for ablation. Initial studies in patients with drug refractory, recurrent VT showed that catheter ablation reduced VT recurrences in over two-thirds of patients.8 With increasing experience in catheter ablation of ventricular arrhythmias, ablation is being considered earlier in the course of the arrhythmia.13 Patients are no longer required to exhaust antiarrhythmic drug therapy or present with a VT storm (commonly defined as three or more VT episodes within 24 hours) in order to be considered for ablation.7 The recognition that VT is associated with adverse outcomes despite the presence of an ICD raises the question as to whether ablation should be performed prophylactically in patients who are receiving an ICD after their first arrhythmic event. Recent randomised clinical studies have demonstrated significant benefits from early VT ablation procedure. The Substrate Mapping and Ablation in Sinus Rhythm to Halt Ventricular Tachycardia (SMASH-VT) study included patients presenting for the first time with VF, haemodynamically unstable VT, or syncope with inducible VT during invasive electrophysiological testing.9 Ablation to modify the arrhythmia substrate significantly reduced the incidence of appropriate ICD therapy. The Ventricular Tachycardia Ablation in Coronary Heart Disease (VTACH) study included patients with ischaemic heart disease, and spontaneous VT who were receiving an ICD.18 Patients randomised to VT ablation prior to ICD implant had a 40 % relative reduction in VT recurrences and fewer hospitalisations during follow-up, although approximately half of the patients treated with ablation still had at least one episode of VT. Although these studies were too small to address the effect of VT ablation on mortality, they provide support for a strategy of early intervention in centres with substantial experience in VT ablations. Scar-related VT is the most common mechanism of sustained monomorphic VT associated with heart disease. Re-entry, involving channels formed by surviving muscle bundles within or adjacent to areas of fibrosis, is often the cause (see Figure 1). Scar that supports re-entrant arrhythmias can be due to prior myocardial infarction, cardiomyopathies, inflammation, infiltrative disorders, familial cardiomyopathies or prior cardiac surgery. A single scar can support multiple re-entry circuits giving rise to multiple VT morphologies. Progressive ventricular remodelling can alter the substrate for ventricular arrhythmias over time, such that the frequency and nature of arrhythmias can change. Hence, ablation of VT/VF in structural heart disease is primarily palliative, aimed at reducing episodes and ICD shocks and is usually not stand-alone therapy, without an ICD. A small number of patients with structural heart disease will have VT that involves the Purkinje system, most commonly re-entry within the bundle branches. A 12-lead ECG offers clues to the potential sites of origin. A left bundle branch block (LBBB) configuration in Lead V1 (dominant S wave) suggests an exit site in the right ventricle or the interventricular septum. A dominant R wave or right bundle branch block (RBBB) pattern in V1 indicates a LV exit site. The QRS axis defines VT origins in the vertical plane; an inferiorly directed QRS axis suggests a superior or anterior wall exit whereas a superiorly directed axis indicated an inferior wall exit. The precordial leads are more indicative of directionality in the horizontal plane. Deep S waves in the apical leads (V3–V6) indicate exit sites at the apex whereas prominent R waves in these leads point to a basal origin of activation. Areas of scar, conduction block and abnormal ventricular anatomy can render these rules misleading. Pacing from the mapping catheter during sinus rhythm (pace-mapping) in an attempt to reproduce the QRS morphology during VT is often a better way of determining the anatomic exit location in any particular individual.19,20 Sub-epicardial origin of VT is suggested by wider QRS complexes and delayed initial upstrokes in the precordial leads.21 Areas of scar containing the re-entrant circuits can extend over several centimetres.22 With current technology, it is often impossible to target all potential sources of VT within a scar. Hence, techniques have been developed to identify re-entrant circuits responsible for individual VTs. Scar-related VTs usually utilise a slow conduction central isthmus bordered by anatomical or functional conduction barriers (see Figure 1).23 A haemodynamically stable clinical VT allows mapping to identify the isthmus where ablation can terminate VT and usually render it non-inducible. Recordings from the exit site of a VT circuit demonstrate electrograms that precede the onset of the surface QRS complexes. Earlier, diastolic electrograms during VT are consistent with sites proximal to the exit in the central or proximal isthmus of the circuit. However, electrogram timing alone is not entirely reliable as a guide to successful ablation sites due to the frequent presence of multiple conduction channels, some of which are bystanders. Hence, additional information is sought with pacing manoeuvres. Pacing with capture from the tip electrode in contact with the tissue of interest indicates electrically excitable tissue. During VT, pacing at a rate slightly faster than the VT rate will result in continuous resetting (entrainment) of the VT. The ability to entrain the tachycardia using criteria set out by Waldo et al. confirms re-entry as a mechanism.24 If the pacing site is within the circuit, the interval from the last paced complex to the first return cycle (post-pacing interval) will approximate the tachycardia cycle length (see Figures 1 and 2). Ablation is more likely to terminate tachycardia if the post-pacing interval is within 30 milliseconds (ms) of tachycardia cycle length, but this can occur at outer loops in a broad re-entry circuit where ablation is often not effective.24,25 The degree of fusion between paced and VT complexes is helpful in further refining the location of an isthmus involved in the VT. QRS fusion occurs if the stimulated wave-front alters activation over a large area to change the ECG. If pacing is performed from the isthmus, the stimulated wavefront emerges from the circuit replicating ventricular activation during VT, a process termed entrainment with concealed fusion (ECF) because the fusion between antidromic and orthodromic wavefronts in the circuit is concealed (see Figure 1). During ECF, the S-QRS indicates the conduction time between the pacing site and the re-entry circuit exit, and matches the local electrogram to QRS during VT. The stimulus to QRS interval (S-QRS) is indicative of the conduction time from the pacing site to the point of exit of the stimulated impulse away from the scar. A short S-QRS would suggest a stimulus closer to the exit whereas a long S-QRS indicates an entrance to the channel. 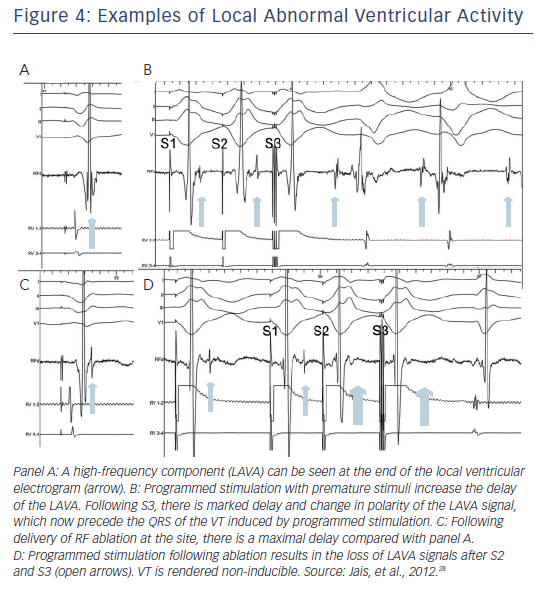 An isthmus serving as a channel for re-entry is suggested by low amplitude isolated potentials that are present during VT, and may also be seen during sinus or paced rhythm as late potentials inscribed after the end of the QRS.26,27 A recent study further expanded the recognition to include potentials within the QRS but splits out during pacing or premature stimuli showing that they are distinct from the far-field ventricular electrogram (see Figure 4). These potentials were defined as local abnormal ventricular activations (LAVA). Recognition of LAVA was facilitated with the aid of a multipolar multipronged catheter (Pentaray, Biosense Webster Inc).28 Ablation resulted in elimination of LAVA in 70 % of patients and was the only factor significantly associated with a reduction in combined endpoint of recurrent VT or death. Interestingly, the absence of inducible VT at the end of the procedure was not predictive of VT-free survival. When endocardial ablation fails due to suspected intramural or unreachable epicardial substrate, such as within the inter-ventricular septum, trans-coronary ethanol ablation (TCEA) can be helpful.34,35 Success of TCEA depends upon favourable coronary anatomy, with a patent vessel supplying the area of interest. Once a suitable branch is identified, the relationship between the branch and a critical portion of the VT circuit is proven by observing that VT terminates with injection of iced saline or by occlusion of the branch by balloon inflation. If VT termination is not achieved, other branches are tested. Once the blood supply to the VT substrate is established, 1 millilitre (ml) of sterile absolute alcohol is injected after balloon occlusion to prevent reflux into other branches. In a series from our centre, acute clinical success was obtained in 56 % of patients; all VT recurrences were prevented in 36 % and improved arrhythmia control was achieved in an additional 27 %.34 The need for this approach is infrequent (1–2 %) and complications include heart block and extension of infarction with further deterioration of LV function. However, in patients with intractable VT unresponsive to traditional ablation techniques, this approach can be life-saving. A damaged Purkinje system is involved in VT in approximately 8–10 % of patients with structural heart disease and recurrent arrhythmias36 VT may be due to catecholamine-sensitive automaticity or re-entry involving the bundle branches. Recently, monomorphic PVCs, usually from the Purkinje system, have been shown to be a trigger for initiation of ventricular fibrillation in patients with no recognised structural heart disease and in patients with ischaemic cardiomyopathy.37,38 Suppression of recurrent VF can be achieved with catheter ablation of the local Purkinje network origin of the triggering PVCs. VT due to re-entry between bundle branches results in sustained monomorphic VT.39 Most commonly, the circulating wavefront propagates up the left bundle and antegrade via the right bundle resulting in VT with typical LBBB pattern. This VT can be entrained from the right ventricle (RV) apex with post-pacing intervals approximating the tachycardia cycle length. A constant relationship of the His deflection preceding the QRS is seen, usually with any oscillation in the H-H interval preceding V-V cycle length alteration. Less frequently, the circuit revolves up the right bundle and down the left producing a typical RBBB type VT. Ablation of either of the bundle branches terminates tachycardia; ablation of the right bundle is easier and preferable to avoid induction of ventricular dyssynchrony from LBBB. Not infrequently, there is an additional conduction system disease and a third of patients will develop heart block requiring pacing support. Many patients also have other scar-related VTs. Idiopathic VT, a diagnosis made after exclusion of significant structural heart disease, is usually due to focal triggered activity or re-entry between fascicular bundles. Catheter ablation is often curative in these patients. Idiopathic outflow tract VTs usually emanate from a discrete focus and their origin is suggested by QRS morphology and axis. They are often non-sustained and accompanied by spontaneous PVCs from the same focus that may be the cause of symptoms. 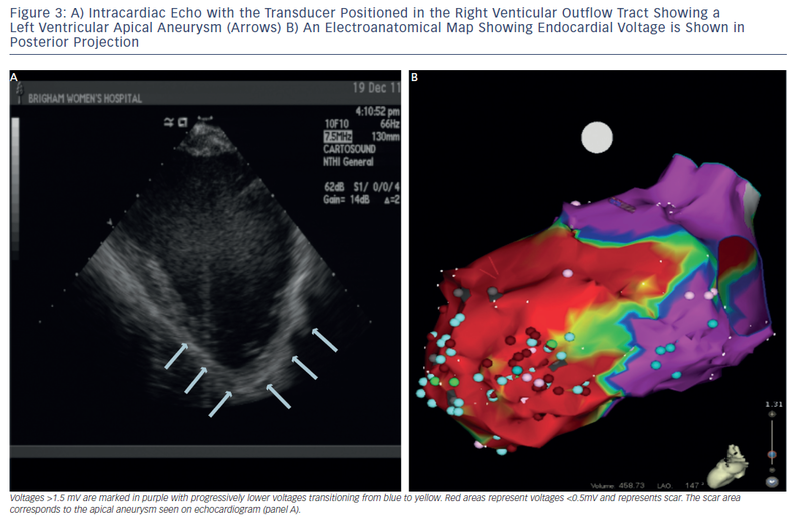 Approximately 80 % of outflow tract VTs arise from the RV outflow tract, the majority from an area 1–2 centimetres (cm) caudal to the pulmonary valve.7 VT from the RV outflow tract has a LBBB pattern with transition in the precordial leads at V3 or V4.7 A free wall (rightward) focus is suggested by wider QRS complexes (>140 ms) and notching in the inferior leads.40 A more leftward focus produces deeper S waves in leads 1 and aVL whereas a lower focus in the RV closer to the His bundle is indicated by positive QRS in aVL. Precise mapping for ablation requires inducible VT or PVCs to allow activation mapping. Earliest activation at successful ablation sites precedes surface QRS by 15–45 ms. Bipolar electrograms often show sharp rapid deflections and unipolar recordings demonstrate a QS pattern. Pace-mapping to identify the site where pacing reproduces the VT QRS can be effective in guiding ablation when the arrhythmia is not present for activation mapping; but it should be recognised that exact pace-maps can sometimes be generated from sites within 4–5 mm of earliest activation.41 RF application often induces acceleration of VT before complete suppression and non-inducibility of the VT or PVC. 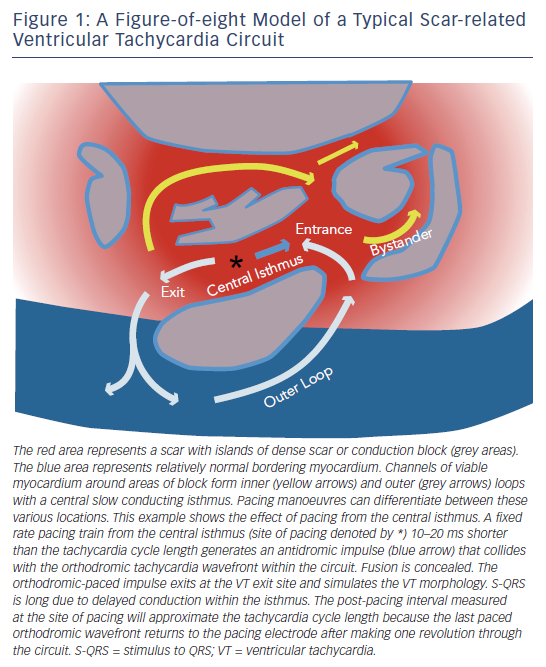 Less frequently, outflow tract VTs are localised to the left ventricle, valve cusps or the origin of the great arteries. LV outflow tract VTs can originate from the base of the septum, the free wall just beneath the aortic valve, aorto-mitral continuity or LV epicardium. QRS complexes demonstrate an inferior axis but show prominent R waves in V1 or V2. LV epicardial VTs require an approach via the great cardiac vein or anterior inter-ventricular vein or by epicardial access as described above. Proximity to coronary arteries often limits application of RF energy in these regions. Aortic cusp VTs emanate from extensions of the ventricular myocardium above the aortic annulus. These foci are approached from the left or right sinus of Valsalva and defined by early activation rather than pace-mapping.42 Typically, a double component electrogram is seen in sinus rhythm due to late activation of this muscle bundle. During PVCs or VT, the second component becomes early preceding QRS by 30–40 ms. Ablation of these targets require that the origin of the coronary arteries be clearly defined and a safe distance (>5 mm)7 established. Intra-cardiac echocardiography can define the origins of the coronary arteries and in conjunction with an electro-anatomic mapping system, define relative locations for safe ablation. Coronary angiography may be necessary for precise definition. VT can also arise from sleeves of myocardium extending above the pulmonary valve into the pulmonary artery. Ablation is required within the pulmonary artery for suppression of these rare VTs. It is important to recognise that electrocardiographic morphology of PVCs or VT may not be accurate in predicting the initiating focus. A systemic approach is often helpful. We always begin mapping in the right ventricular outflow tract (RVOT), then above the pulmonary valve followed by the great cardiac vein, aortic cusps and left ventricular outflow tract (LVOT). Mapping of the great cardiac vein is specifically recommended before pericardial puncture for epicardial mapping, as epicardial foci are more likely to be identified from within the coronary venous system than the epicardium.7,43 In either case, proximity to major coronary arteries will preclude ablation attempts in some patients due to proximity to major epicardial arteries. In markedly symptomatic patients or those with tachycardia-induced cardiomyopathy, we have in rare cases, utilised a surgical approach using cryoablation after mobilising coronary vessels away from the area of interest. In a recent report of 278 patients undergoing ablation for idiopathic PVCs or VT, 29 (10 %) had VT from the lower RV body with half of them arising from regions within 2 cm of the tricuspid valve annulus.44 All had LBBB morphology. Ablation was effective in preventing long-term recurrence of PVCs or VT in 80 % of patients. It is particularly important to exclude arrhythmogenic RV cardiomyopathy is such patients; voltage maps of the right ventricle can be helpful in excluding endocardial areas of RV scar, but epicardial areas of scar can escape detection during endocardial mapping. Focal VTs from the region of the mitral annulus accounted for 5 % of idiopathic VTs in one series.45 Areas of the valve annulus included the antero-septal region in 58 %, posterior or posteroseptal in the remaining. Similar to aortic cusp VT, a delayed potential is observed during sinus rhythm at the valve annulus. During VT this potential preceded the QRS by as early as 70 ms. The possibility of a remnant of the atrioventricular ring has been suggested as the potential mechanism for these annular VTs. Endocardial ablation is usually successful in suppressing VT; occasionally, an approach via the coronary sinus may be necessary. Belhassen and co-workers demonstrated that a RBBB, left axis VT occurring in patients with structurally normal hearts could be terminated with intravenous verapamil.46 This VT typically involves the posterior fascicle in the left ventricular septum and comprise the majority of idiopathic LV VTs. Re-entry involving the fascicle of the LBB can be demonstrated by multi-electrode mapping that often identifies the circuit along the inferoseptal aspect of the LV. Two other forms of verapamil-sensitive VTs have been described; a left anterior fascicular VT with RBBB right axis deviation and an upper septal fascicular VT with a narrow QRS configuration and a normal or right axis deviation.47 For the typical posterior fascicular VT, RF ablation is usually directed at the anterograde Purkinje potentials more apically rather than proximally to avoid injury to the left bundle. Barotrauma from catheter manipulation can terminate tachycardia and render them non-inducible. Empiric lines of ablation along the region may have to be created to prevent recurrence. Idiopathic VT arising from the LV papillary muscle is a distinct subgroup but can demonstrate QRS morphology similar to fascicular VT.48 The arrhythmias can be exercise-induced and catecholamine-sensitive, but most commonly present as PVCs rather than sustained VT. They appear to have a focal automatic mechanism. Differentiation from fascicular VT is based on absence of early Purkinje potentials, spontaneous variations in QRS morphology and early activation located in the region of the papillary muscle identified by echocardiography. Variations in QRS morphology can be subtle and may be due to preferential conduction to different exit sites or multiple regions of origin.48 Ablation is technically challenging due to unstable catheter contact with the contracting papillary muscle; the use of intracardiac echocardiography is helpful for visualisation of catheter positioning. Irrigated tip or 8 mm catheters are often necessary for successful ablation due to deeper endocardial origins. Outcomes vary depending on the presence or absence of structural heart disease. For VT associated with structural heart disease, ablation typically aims at palliation to reduce recurrent arrhythmias and prevent defibrillator shocks. Hence, interpretation of results of ablation is often clouded by the presence of inducible VTs that have not been seen to occur spontaneously and that are not targeted by ablation. The target VT is rendered acutely non-inducible in 70–90 % of patients.7,49 The success rate of abolishing all inducible VTs is significantly lower (approximately 50 %).8,50 A recent meta-analysis of four randomised and one observational study of VT ablation for structural heart disease demonstrated a significant 38 % reduction in VT recurrence compared with medical therapy.51 In addition, adjunctive catheter ablation showed a trend toward reduction in electrical storms provoking multiple ICD shocks. Ablation did not influence mortality in this patient population; over a mean follow-up of approximately two years, 12 % in the ablation group and 14 % in medical therapy group died. In the thermocool VT ablation trial, inducible VTs at the end of the procedure were associated with VT recurrence.8 However, VT inducibility has not been shown to predict recurrence in other studies.50 The European Heart Rhythm Association (EHRA)/Heart Rhythm Society (HRS) consensus guideline suggest that the minimum endpoint should be elimination of the clinical VT (if documented).7 It is our practice to try and eliminate all inducible VTs if patients are haemodynamically stable and tolerating the procedure well. Ablation of idiopathic VT is successful in approximately 80 % of patients; those arising from the RV outflow tract and the interfascicular re-entrant arrhythmias yield the highest success rates. Failures are usually due to inability to induce the arrhythmia reliably or arrhythmia locations that are beyond safe access with an ablation catheter, such as in the epicardial locations close to the coronary arteries. Catheter ablation of VT can be challenging. As in many fields of medicine, the best way of managing complications is by preventing them. This includes appropriate patient selection. Patients with severe LV dysfunction can have major haemodynamic consequences following prolonged procedures. The risk of haemodynamic deterioration can be reduced by optimisation of heart failure therapy prior to the procedure, intra-procedural monitors of filling pressures, haemodynamic support if necessary, choosing the right anaesthetic agent and careful attention to fluid loading. Prior knowledge of peripheral arterial disease and presence of mechanical prosthetic valve in the aortic position will allow for planning of a trans-septal approach. Prior cardiac surgery will limit trans-catheter epicardial approach. Pre-procedure echocardiography should be routine to exclude intracardiac thrombus in patients with structural heart disease who are undergoing LV mapping and attention to anticoagulation is mandatory to prevent thromboembolic complications. The HRS/ EHRA VT consensus report recommends a target activated clotting time (ACT) level of ≥250 seconds (s) during procedures involving the LV.7 Anticoagulation with warfarin for six weeks is often employed in cases with extensive ablation, but there are no data evaluating warfarin or aspirin. Every exchange of catheters or guidewires through the sheaths should prompt flushing of the sheaths to prevent air embolism. Limiting RF power in areas vulnerable to rupture such as RV free wall can potentially avoid ‘steam pops’ that are a cause of cardiac tamponade.53 Prompt cardiac surgery can be life-saving in the event of cardiac perforation and onsite surgical backup is an important safeguard.54 In cases of epicardial access a safe distance from epicardial coronary arteries and the phrenic nerve has to be established by angiography and high output pacing prior to ablation. In summary, catheter ablation is an effective therapy for reducing VT recurrence in patients with structural heart disease and often curative in idiopathic VT. However, the procedure can be complex especially when patients are haemodynamically unstable in VT storm. It is essential to plan in advance with the team participating in the procedure. This includes an anaesthesiologist, and nursing and cardiovascular technicians. Careful planning and knowledge of the various techniques, approach and management of complications are the key components of successful VT ablation. Zipes DP, Camm AJ, Borggrefe M, et al. ACC/AHA/ESC 2006 Guidelines for Management of Patients With Ventricular Arrhythmias and the Prevention of Sudden Cardiac Death: a report of the American College of Cardiology/American Heart Association Task Force and the European Society of Cardiology Committee for Practice Guidelines (writing committee to develop Guidelines for Management of Patients With Ventricular Arrhythmias and the Prevention of Sudden Cardiac Death): developed in collaboration with the European Heart Rhythm Association and the Heart Rhythm Society. Circulation 2006;114:e385–484. Sweeney MO. The contradiction of appropriate shocks in primary prevention ICDs: increasing and decreasing the risk of death. Circulation 2010;122:2638–41. Connolly SJ, Dorian P, Roberts RS, et al. Comparison of beta-blockers, amiodarone plus beta-blockers, or sotalol for prevention of shocks from implantable cardioverter defibrillators: the OPTIC Study: a randomized trial. JAMA 2006;295:165–71. Brodsky M, Wu D, Denes P, et al. Arrhythmias documented by 24 hour continuous electrocardiographic monitoring in 50 male medical students without apparent heart disease. Am J Cardiol 1977;39:390–5. Baman TS, Ilg KJ, Gupta SK, et al. Mapping and ablation of epicardial idiopathic ventricular arrhythmias from within the coronary venous system. Circ Arrhythm Electrophysiol 2010;3:274–9. Aliot EM, Stevenson WG, Almendral-Garrote JM, et al. EHRA/ HRS Expert Consensus on Catheter Ablation of Ventricular Arrhythmias: developed in a partnership with the European Heart Rhythm Association (EHRA), a Registered Branch of the European Society of Cardiology (ESC), and the Heart Rhythm Society (HRS); in collaboration with the American College of Cardiology (ACC) and the American Heart Association (AHA). Heart Rhythm 2009;6:886–933. Stevenson WG, Wilber DJ, Natale A, et al. Irrigated radiofrequency catheter ablation guided by electroanatomic mapping for recurrent ventricular tachycardia after myocardial infarction: the multicenter thermocool ventricular tachycardia ablation trial. Circulation 2008;118:2773–82. Reddy VY, Reynolds MR, Neuzil P, et al. Prophylactic catheter ablation for the prevention of defibrillator therapy. N Engl J Med 2007;357:2657–65. Kuck KH, Reddy VY, Schmidt B, et al. A novel radiofrequency ablation catheter using contact force sensing: Toccata study. Heart Rhythm 2012;9:18–23. Ren JF, Marchlinski FE. Utility of intracardiac echocardiography in left heart ablation for tachyarrhythmias. Echocardiography 2007;24:533–40. Sosa E, Scanavacca M. Epicardial mapping and ablation techniques to control ventricular tachycardia. J Cardiovasc Electrophysiol 2005;16:449–52. Roberts-Thomson KC, Steven D, Seiler J, et al. Coronary artery injury due to catheter ablation in adults: presentations and outcomes. Circulation 2009;120:1465–73. Fan R, Cano O, Ho SY, et al. Characterization of the phrenic nerve course within the epicardial substrate of patients with nonischemic cardiomyopathy and ventricular tachycardia. Heart Rhythm 2009;6:59–64. Soejima K, Couper G, Cooper JM, et al. Subxiphoid surgical approach for epicardial catheter-based mapping and ablation in patients with prior cardiac surgery or difficult pericardial access. Circulation 2004;110:1197–201. Yokokawa M, Good E, Crawford T, et al. Value of right ventricular mapping in patients with postinfarction ventricular tachycardia. Heart Rhythm 2012;9:938–42. Miller MA, Dukkipati SR, Mittnacht AJ, et al. Activation and entrainment mapping of hemodynamically unstable ventricular tachycardia using a percutaneous left ventricular assist device. J Am Coll Cardiol 2011;58:1363–71. Kuck KH, Schaumann A, Eckardt L, et al. Catheter ablation of stable ventricular tachycardia before defibrillator implantation in patients with coronary heart disease (VTACH): a multicentre randomised controlled trial. Lancet 2010;375:31–40. Brunckhorst CB, Stevenson WG, Soejima K, et al. Relationship of slow conduction detected by pace-mapping to ventricular tachycardia re-entry circuit sites after infarction. J Am Coll Cardiol 2003;41:802–9. Marchlinski FE, Callans DJ, Gottlieb CD, Zado E. Linear ablation lesions for control of unmappable ventricular tachycardia in patients with ischemic and nonischemic cardiomyopathy. Circulation 2000;101:1288–96. Vallès E, Bazan V, Marchlinski FE. ECG criteria to identify epicardial ventricular tachycardia in nonischemic cardiomyopathy. Circ Arrhythm Electrophysiol 2010;3:63–71. de Chillou C, Lacroix D, Klug D, et al. Isthmus characteristics of reentrant ventricular tachycardia after myocardial infarction. Circulation 2002;105:726–31. Stevenson WG, Tedrow UB. Ablation for ventricular tachycardia during stable sinus rhythm. Circulation 2012;125:2175–7. Waldo AL, Henthorn RW. Use of transient entrainment during ventricular tachycardia to localize a critical area in the reentry circuit for ablation. Pacing Clin Electrophysiol 1989;12(1 Pt 2):231–44. Waldo AL. From bedside to bench: entrainment and other stories. Heart Rhythm 2004;1:94–106. Bogun F, Good E, Reich S, et al. Isolated potentials during sinus rhythm and pace-mapping within scars as guides for ablation of post-infarction ventricular tachycardia. J Am Coll Cardiol 2006;47:2013–9. Kuhne M, Abrams G, Sarrazin JF, et al. Isolated potentials and pace-mapping as guides for ablation of ventricular tachycardia in various types of nonischemic cardiomyopathy. J Cardiovasc Electrophysiol 2010;21:1017–23. Jaïs P, Maury P, Khairy P, et al. Elimination of local abnormal ventricular activities: a new end point for substrate modification in patients with scar-related ventricular tachycardia. Circulation 2012;125:2184–96. Di Biase L, Santangeli P, Burkhardt DJ, et al. Endo-epicardial homogenization of the scar versus limited substrate ablation for the treatment of electrical storms in patients with ischemic cardiomyopathy. J Am Coll Cardiol 2012;60:132–41. Bogun F, Crawford T. Ablation for ventricular tachycardia: is more always better? How much more is too much? J Am Coll Cardiol 2012;60:142–3. Sacher F, Roberts-Thomson K, Maury P, et al. Epicardial ventricular tachycardia ablation a multicenter safety study. J Am Coll Cardiol 2010;55:2366–72. Hutchinson MD, Gerstenfeld EP, Desjardins B, et al. Endocardial unipolar voltage mapping to detect epicardial ventricular tachycardia substrate in patients with nonischemic left ventricular cardiomyopathy. Circ Arrhythm Electrophysiol 2011;4:49–55. Cano O, Hutchinson M, Lin D, et al. Electroanatomic substrate and ablation outcome for suspected epicardial ventricular tachycardia in left ventricular nonischemic cardiomyopathy. J Am Coll Cardiol 2009;54:799–808. Tokuda M, Sobieszczyk P, Eisenhauer AC, et al. Transcoronary ethanol ablation for recurrent ventricular tachycardia after failed catheter ablation: an update. Circ Arrhythm Electrophysiol 2011;4:889–96. Yoshida K, Yokokawa M, Desjardins B, et al. Septal involvement in patients with post-infarction ventricular tachycardia: implications for mapping and radiofrequency ablation. J Am Coll Cardiol 2011;58:2491–500. Lopera G, Stevenson WG, Soejima K, et al. Identification and ablation of three types of ventricular tachycardia involving the his-purkinje system in patients with heart disease. J Cardiovasc Electrophysiol 2004;15:52–8. Haïssaguerre M, Shoda M, Jaïs P, et al. Mapping and ablation of idiopathic ventricular fibrillation. Circulation 2002;106:962–7. Bansch D, Oyang F, Antz M, et al. Successful catheter ablation of electrical storm after myocardial infarction. Circulation 2003;108:3011–6. Blanck Z, Jazayeri M, Dhala A, et al. Bundle branch reentry: a mechanism of ventricular tachycardia in the absence of myocardial or valvular dysfunction. J Am Coll Cardiol 1993;22:1718–22. Dixit S, Gerstenfeld EP, Callans DJ, Marchlinski FE. Electrocardiographic patterns of superior right ventricular outflow tract tachycardias: distinguishing septal and free-wall sites of origin. J Cardiovasc Electrophysiol 2003;14:1–7. Azegami K, Wilber DJ, Arruda M, et al. Spatial resolution of pacemapping and activation mapping in patients with idiopathic right ventricular outflow tract tachycardia. J Cardiovasc Electrophysiol 2005;16:823–9. Hachiya H, Aonuma K, Yamauchi Y, et al. How to diagnose, locate, and ablate coronary cusp ventricular tachycardia. J Cardiovasc Electrophysiol 2002;13:551–6. Yamada T, McElderry HT, Doppalapudi H, et al. Idiopathic ventricular arrhythmias originating from the left ventricular summit: anatomic concepts relevant to ablation. Circ Arrhythm Electrophysiol 2010;3:616–23. Van Herendael H, Garcia F, Lin D, et al. Idiopathic right ventricular arrhythmias not arising from the outflow tract: prevalence, electrocardiographic characteristics, and outcome of catheter ablation. Heart Rhythm 2011;8:511–8. Tada H, Ito S, Naito S, et al. Idiopathic ventricular arrhythmia arising from the mitral annulus: a distinct subgroup of idiopathic ventricular arrhythmias. J Am Coll Cardiol 2005;45:877–86. Belhassen B, Rotmensch HH, Laniado S. Response of recurrent sustained ventricular tachycardia to verapamil. Br Heart J 1981;46:679–82. Ohe T, Shimomura K, Aihara N, et al. Idiopathic sustained left ventricular tachycardia: clinical and electrophysiologic characteristics. Circulation 1988;77:560–8. Yamada T, Doppalapudi H, McElderry HT, et al. Electrocardiographic and electrophysiological characteristics in idiopathic ventricular arrhythmias originating from the papillary muscles in the left ventricle: relevance for catheter ablation. Circ Arrhythm Electrophysiol 2010;3:324–31. Soejima K, Stevenson WG, Maisel WH, et al. Electrically unexcitable scar mapping based on pacing threshold for identification of the reentry circuit isthmus: feasibility for guiding ventricular tachycardia ablation. Circulation 2002;106:1678–83. Tanner H, Hindricks G, Volkmer M, et al. Catheter ablation of recurrent scar-related ventricular tachycardia using electroanatomical mapping and irrigated ablation technology: results of the prospective multicenter Euro-VT-study. J Cardiovasc Electrophysiol 2010;21:47–53. Mallidi J, Nadkarni GN, Berger RD, et al. Meta-analysis of catheter ablation as an adjunct to medical therapy for treatment of ventricular tachycardia in patients with structural heart disease. Heart Rhythm 2011; 8:503–10. Frankel DS, Mountantonakis SE, Zado ES, et al. Noninvasive programmed ventricular stimulation early after ventricular tachycardia ablation to predict risk of late recurrence. J Am Coll Cardiol 2012;59:1529–35. Seiler J, Roberts-Thomson KC, Raymond JM, et al. Steam pops during irrigated radiofrequency ablation: feasibility of impedance monitoring for prevention. Heart Rhythm 2008;5:1411–6. Tokuda M, Kojodjojo P, Epstein LM, et al. Outcomes of cardiac perforation complicating catheter ablation of ventricular arrhythmias. Circ Arrhythm Electrophysiol; 2011;4:660–6.